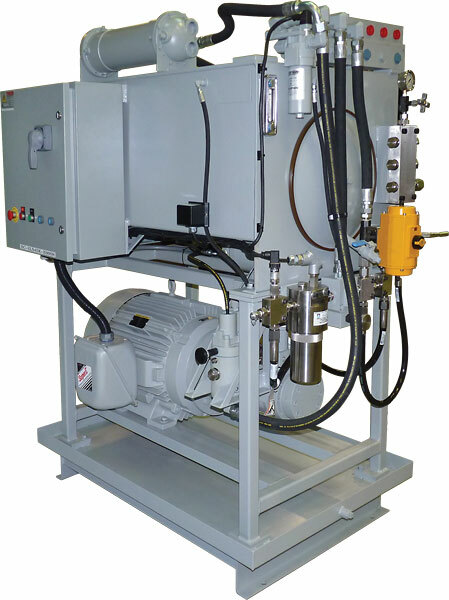 Aerospace engineers require test-stand pumps that can withstand the high pressures and harsh conditions needed for testing aircraft components. Checkball pumps operate with exceptional performance at pressures to 15 000 psi (1040 bar), with Skydrol and various MIL-SPEC fluids. That’s why the engineers at Sikorsky Aircraft Corporation use Dynex power units with checkball pumps for endurance testing their helicopter tail rotors. The units operate with MIL-H-83282 fluid, supplying 10.5 gpm at 7500 psi (40 L/min at 520 bar). The test circuit includes a Dynex VHR high-pressure safety relief valve. A Dynex H8819 proportional relief valve varies the system pressure up to 7500 psi (720 bar) in response to an electrical signal from a potentiometer on a remote control box.